“What is being proposed is dumping a problem from one neighborhood to another without actually solving the issue,” says Graham Bosworth of a proposal to move and expand hazardous rail traffic out of Old Metarie and into his Hollygrove Dixon community in New Orleans, Louisiana. As staff of Women With a Vision and BreakOUT!, two organizations that work to promote safer, healthier communities in New Orleans for women and LGBTQ communities, including youth and transgender women, we wrote the below guest blog in response to recent coverage by the Times-Picayune about people involved (or assumed to be involved) in street economies along Tulane Avenue. Where are you from, originally? This simple question was the topic of a discussion at Community Book Center in New Orleans last week, and prompted a sweeping conversation about race, class, displacement, and what it means to be from this rapidly changing city with deep roots. By Lance Hill. Crossposted from Justice Roars. On September 22 the Census Bureau released information from their 2010 annual American Community Survey based on a poll of 2,500 people in New Orleans. By Jordan Flaherty, Images by Zeph Fish. 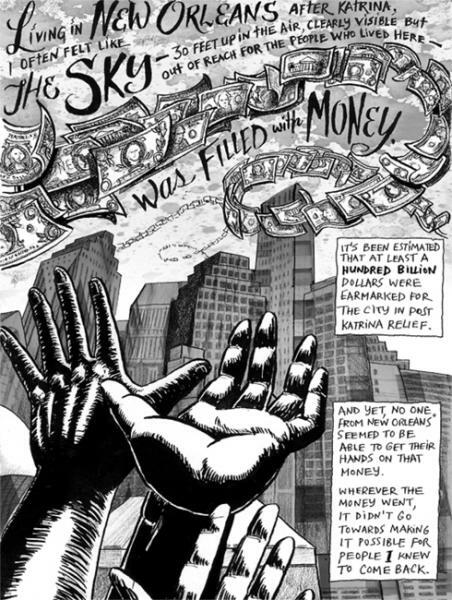 Graphic essay orgininally published in Truthout.